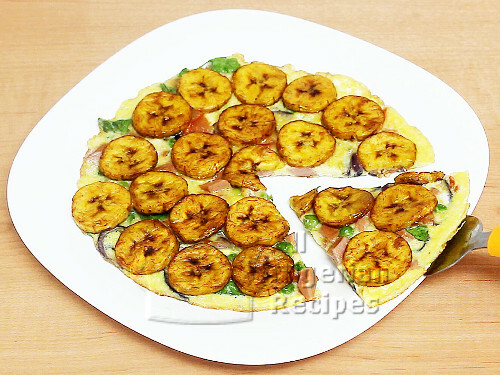 Plantain Omelette gives you the chance to enjoy an exotic breakfast of omelette with fried plantains in one dish. For best results, use ripe but firm plantains. These leafy vegetables work well with this recipe: Ugu, Spinach and Scent leaves. 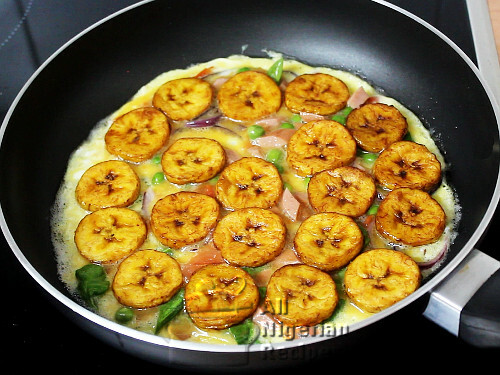 Peel and slice the plantain into thin discs (see video). Fry till golden and set aside. Slice the onions, habanero pepper (if using it) and the leafy vegetables. Cut the frankfurter and tomato into small pieces. See the video to see how I cut mine. Break the eggs, beat, add the salt and mix very well. Fry the onions in a small quantity of vegetable oil for 1 minute. Add the tomato, frankfurters and green peas and fry for 2 minutes. Pour the result into the egg, add the sliced leaf vegetables and stir. Heat a small quantity of vegetable oil and pour the egg mix from step 3 into the pan such that the mix is well spread out to cover the pan. Reduce the heat to very low and once the edge of the omelette cakes, lay the fried plantains flat on the omelette to cover it. Shake your frying pan from time to time and once the plantain omelette cakes all over, gently transfer it to a flat plate, see video. Slice up like pizza and enjoy with other breakfast dishes.